Currently I’m doing some light training for a Susan G. Komen 5k next month. I’m trying to start participating more in any charity runs in the area and I would love to complete a marathon in the next few years. I told myself if I could stay in a decent training routine for 3+ weeks that I would buy a new pair of shoes. My Asics were pretty beat and the backs were giving me blisters. I was able to get to the gym after work and complete 3-4 decent runs a week in the past month. I think the key for me was bringing my gym clothes in the car and going on my way home. Give that a try if you are having difficulty getting into routine. So this past weekend since I was able to meet my goal I picked up a new pair of shoes (Nike Lunarglide+ 2) (love them) and also picked up a Nike + sensor over the past weekend. 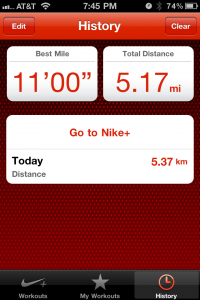 Nike + iPod is awesome. The iPhone 4 has built in capabilities to obtain run data from the shoe sensor. 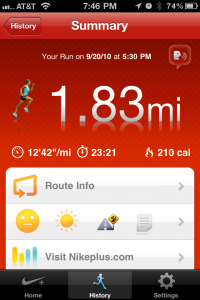 During your run it tracks your distance, pace, and calories burnt. There is also an GPS app available that tracks and maps out your route. 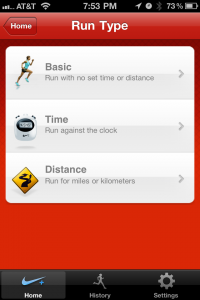 After your run it syncs with your account on nikeplus.com. Nikeplus.com lets you add friends, challenge friends, and set every type of goal imaginable. This sensor and app make me want to run everyday. Its really a great motivator and good technology to help you run more often. Left: Both apps, Not sure which one I’m going to use as my primary. 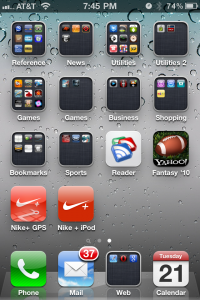 For now I’m using the Nike+ GPS app for outdoor runs and Nike + iPod app for indoor. Right: the start a new run menu on the GPS app. Left: the run summary view within the GPS app. Right: the run history summary within the Nike+ iPod app.